• Immerse yourself fully in the science of Sampoorna Yoga under the close guidance of Guruji. • Channel your energy and direct it in a way suited to your personality, and experience rapid transformation and success in your spiritual evolution. • Appreciate the amazing positive transformation that will take place in a year! 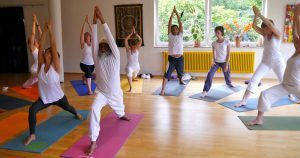 If you are interested in this program and have not visited the ashram before, we recommend that you visit and spend some time here before committing to a year-long intensive program. As this is a small ashram, we would like to ensure that all program participants are harmonious to facilitate an environment of learning and personal growth. Interested? Email or call us at 954-399-8000 for more information.